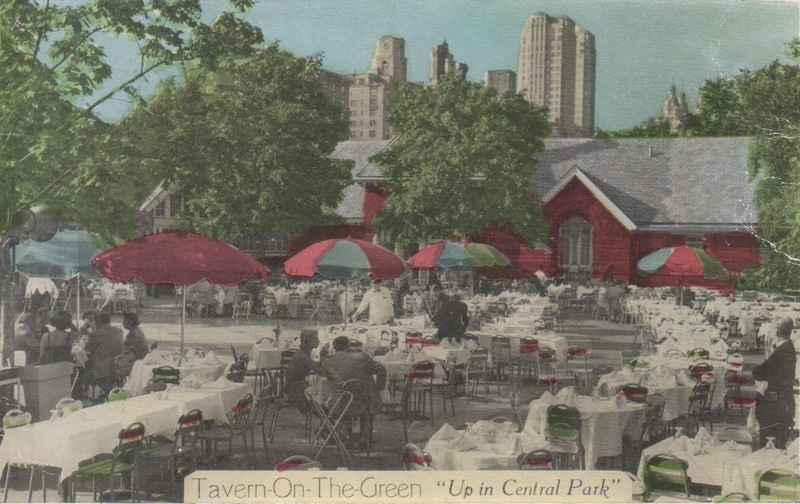 Central Park’s great lawn is a lovely, sprawling place for sunbathing, picnics, and playing ball. 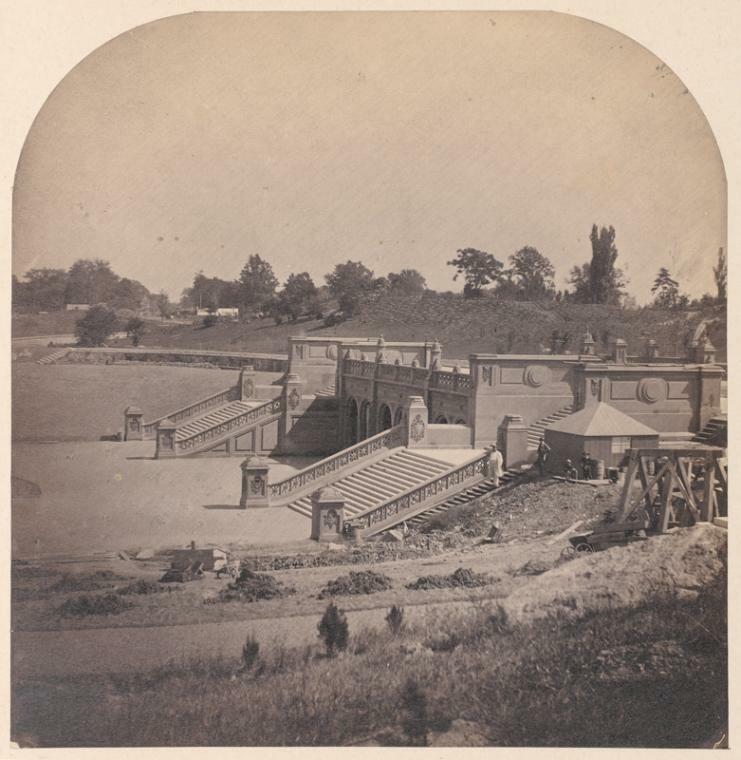 But it was never part of the original plan for the park because the land, located between 79th and 86th Streets between Sixth and Seventh Avenues, was already in use. 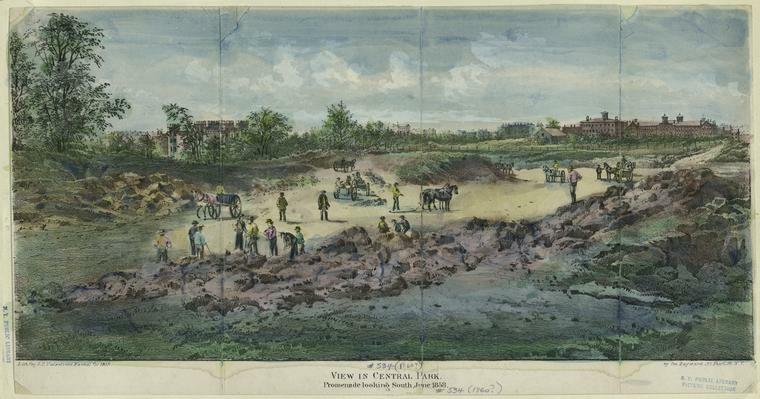 In 1842, it was the site of New York’s new, 31-acre Receiving Reservoir, the body of water built to store fresh drinking water piped in from upstate via the just-completed Croton Aqueduct. Built on high ground on rocky, unpopulated terrain, the reservoir held water that could easily flow down to the southern end of Manhattan, where the city existed at the time. 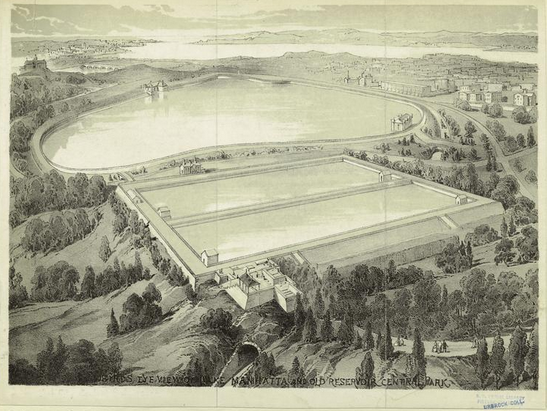 “Unlike the grand Distributing Reservoir [on 42nd Street and Fifth Avenue], designed in the popular Egyptian Revival style, the Receiving Reservoir was simple and practical,” states nyc.gov. 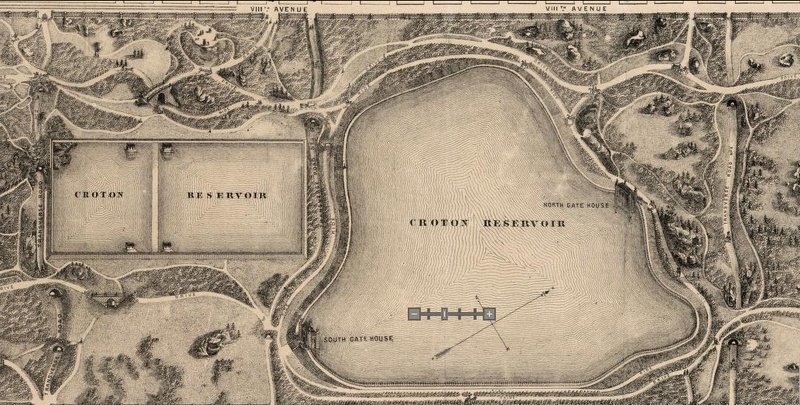 When Frederick Law Olmsted and Calvert Vaux began developing the park in the late 1850s, they weren’t too happy with the rectangular reservoir, which didn’t mesh with their pastoral, naturalistic design. 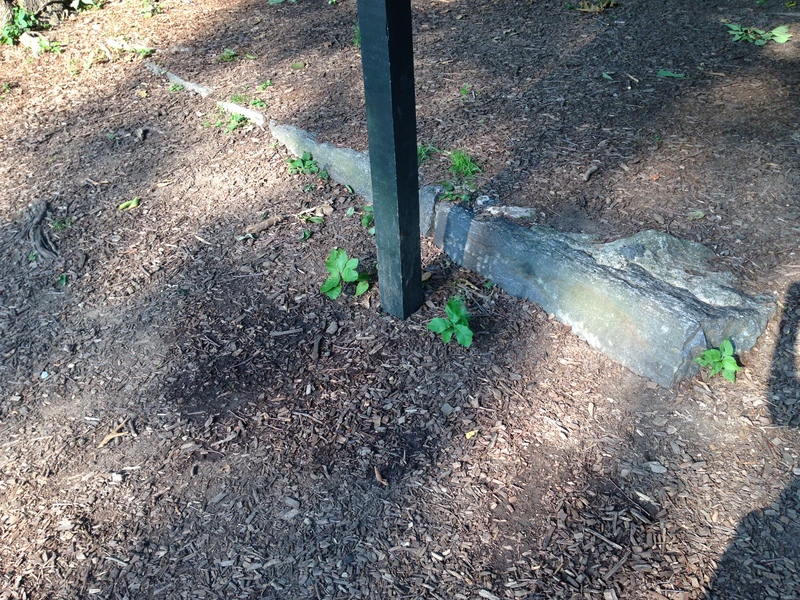 But since they couldn’t get rid of it, they hid it behind a grove of trees. 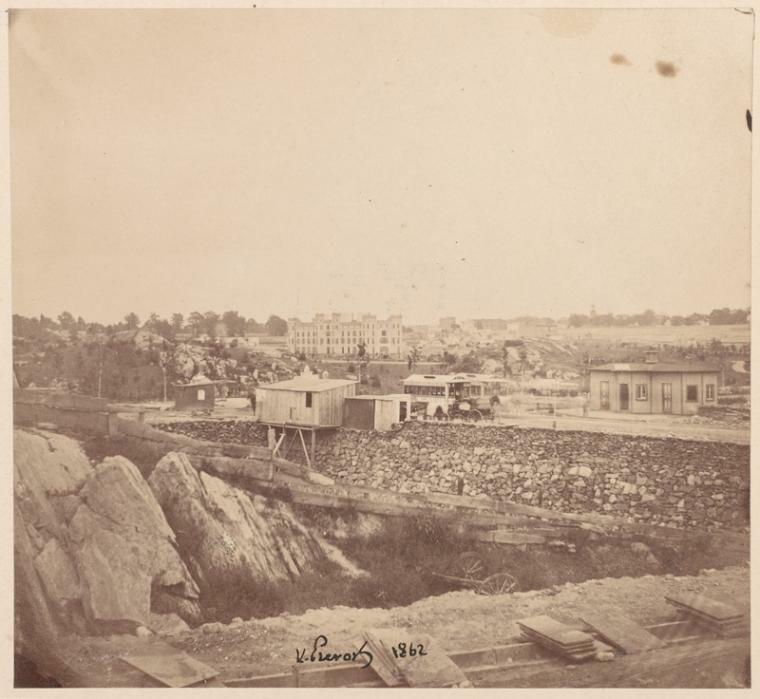 A second receiving reservoir built in a more natural, oval shape in the 1860s just north of the original reservoir (above) fit their plan better. 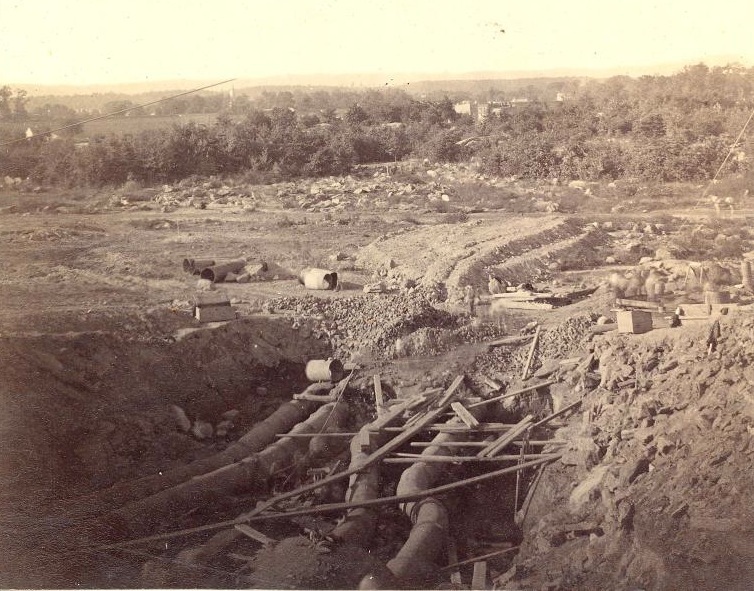 With New York’s population in the late 19th century multiplying year by year and water usage increasing, the Receiving Reservoir’s days were numbered. After the completion of a new water tunnel in 1917, it was finally drained in 1929. Plans to turn the land into a World War I memorial and then a promenade linking the Metropolitan Museum of Art with the Museum of Natural History didn’t pan out. Incredibly, remnants of the Receiving Reservoir can be found here and there. 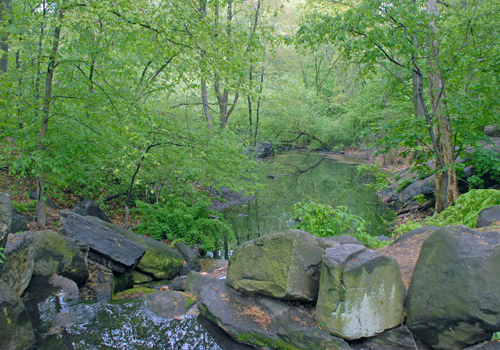 “The bedrock that forms the edge of Turtle Pond is the same that formed the southwest corner of the reservoir,” states nyc.gov. The ghostly, granite remains of the 42nd Street Distributing Reservoir can be seen on a lower wall of the New York Public Library. 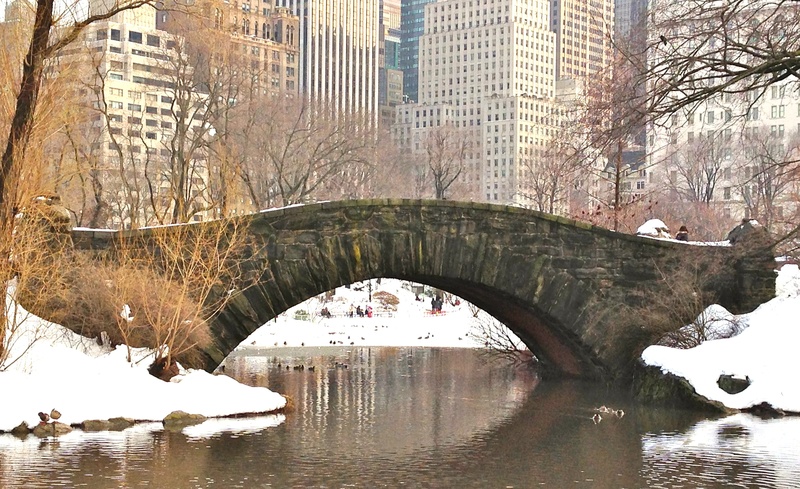 At least 36 arches and bridges curve and bend along the 843 acres of Central Park, tucked into the rolling landscape like little treasures. 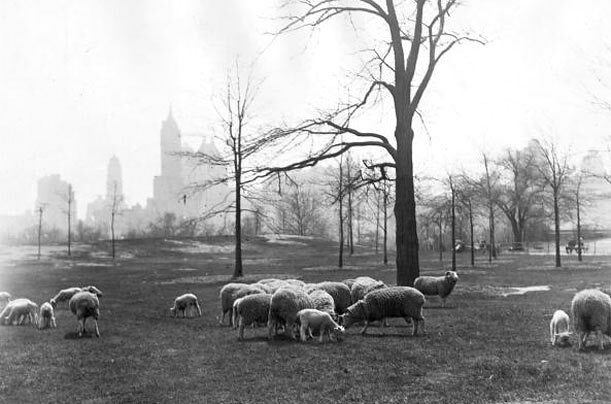 Some were part of the original vision for the park, developed by Calvert Vaux and Frederick Law Olmsted in the 1850s. Others came in the 1860s and 1870s. Some span land, some cross water—but all are lovely, especially covered by snow, and they represent a range of styles and designs. 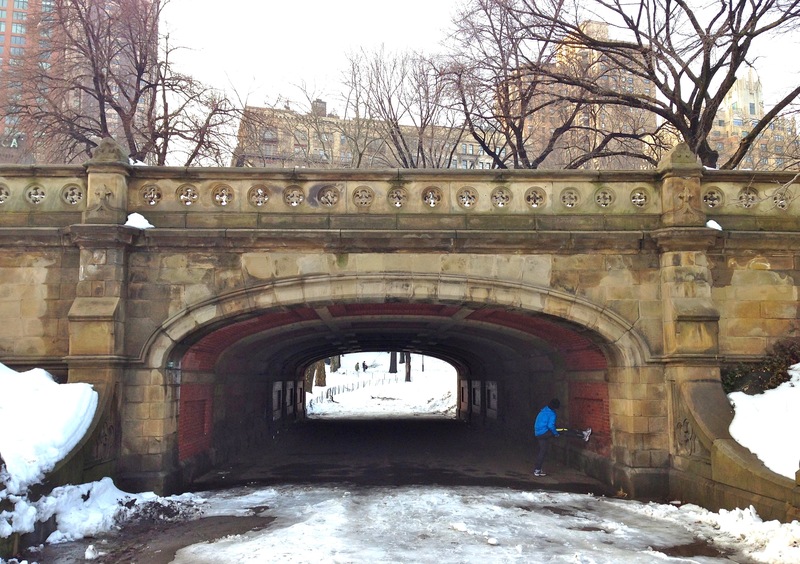 The elegant, cast-iron Southwest Reservoir Arch, above, built in 1865, crosses the Bridle Path. 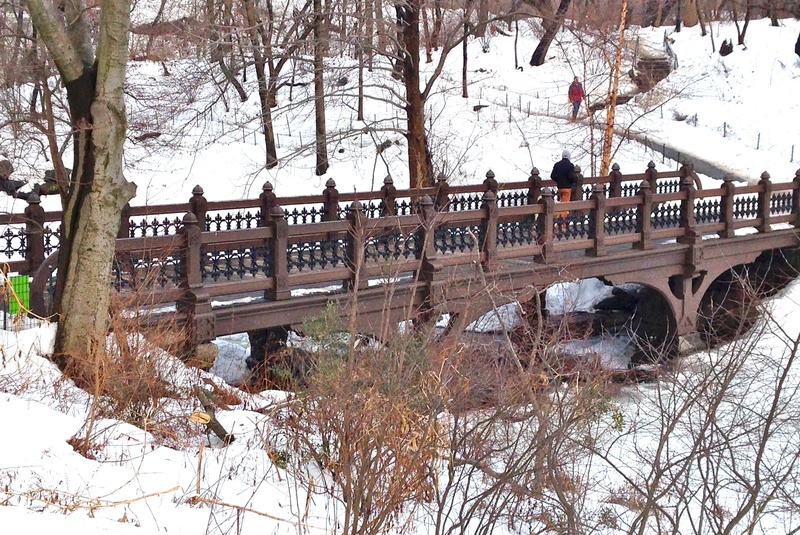 Oak Bridge, which spans Bank Rock Bay at the entrance to the Ramble, was originally constructed in 1860 from white oak, with decorative cast iron in the railings. 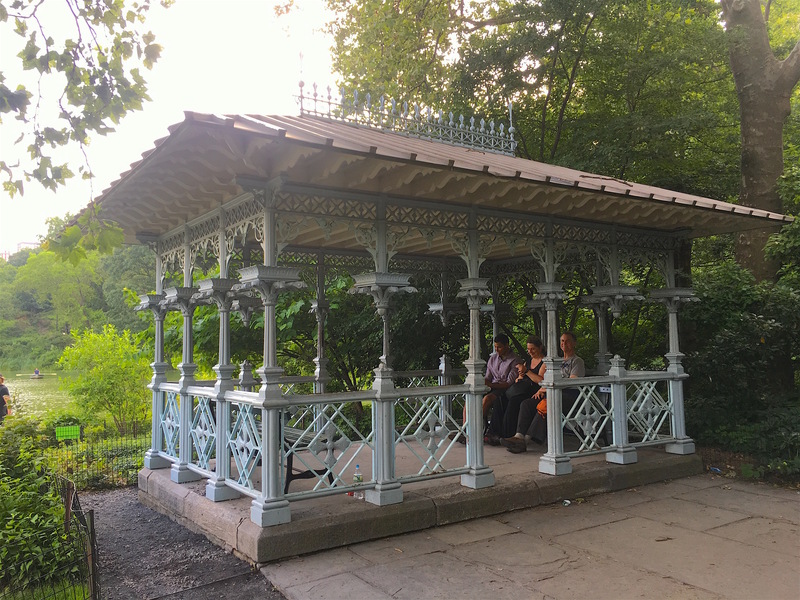 The wood deteriorated over the years, and in 2009 the Central Park Conservatory rebuilt Oak Bridge using steel on the bridge itself and wood for the railings. Dalehead Arch is on the West Side near 64th Street. Made of sandstone and brownstone with pretty cutouts, it dates back to the 1860s. 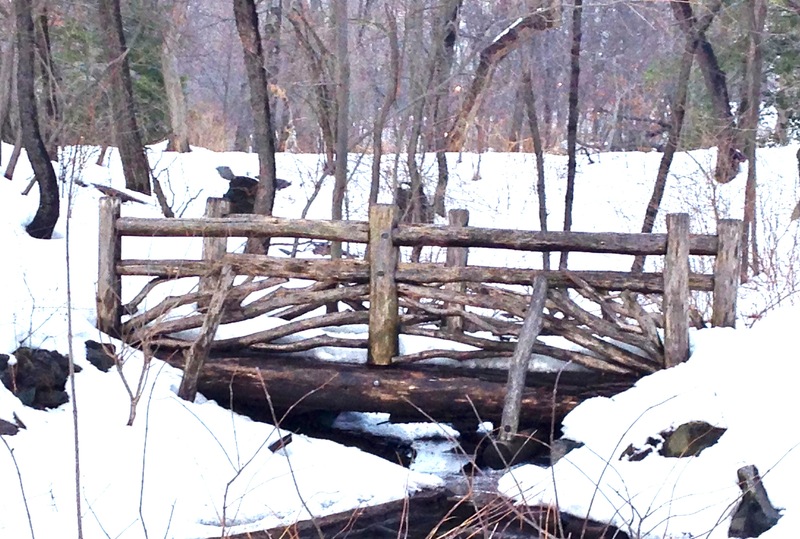 If this rustic bridge in the Ramble has a name, I couldn’t find it! 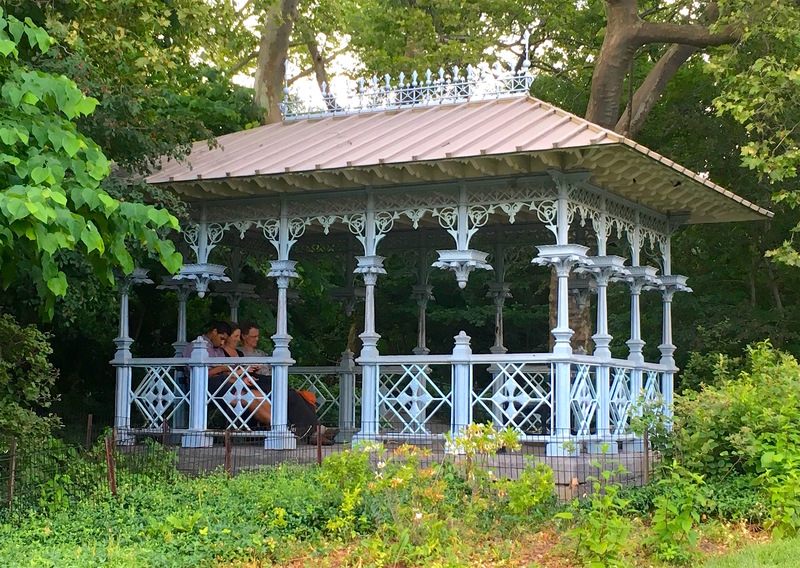 It’s an homage to the natural vision Olmsted and Vaux had for the park. 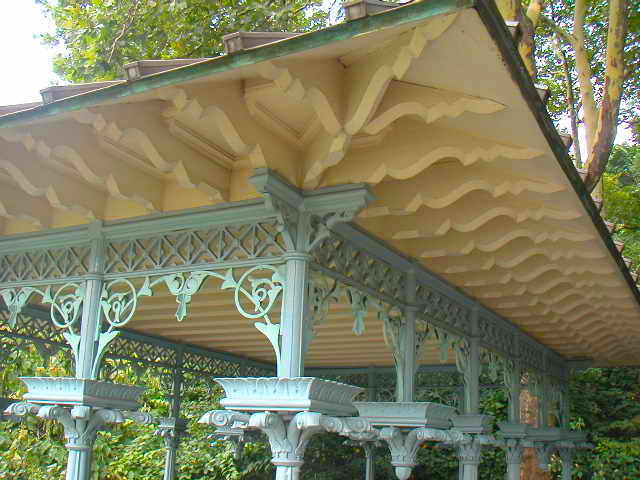 And of course, probably the most iconic bridge in the park is the one at Bethesda Terrace, with its dazzling ceiling tiles. 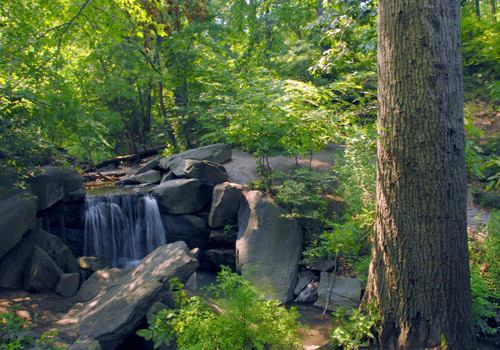 Calvert Vaux and Frederick Law Olmsted’s plan for Central Park in 1857 was to bring the serenity of nature to a swampy, rocky stretch of the city. 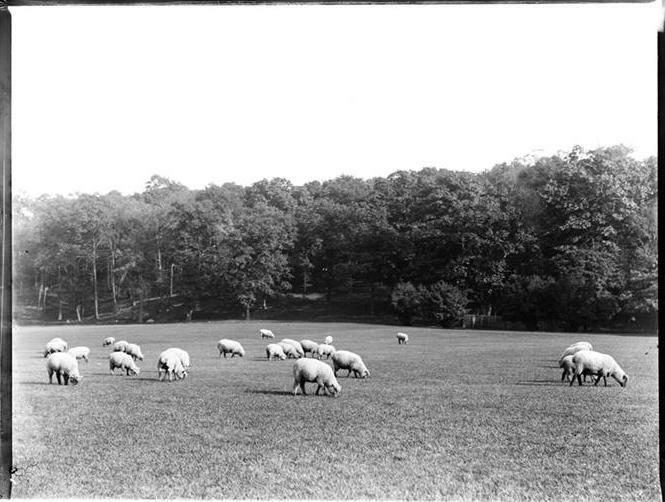 After bulldozing shantytowns and draining swamps, they (and masses of laborers) spent the next several years fabricating pastoral lawns, hills, ponds, and lakes. The also created the North Woods: a 90-acre refuge at the northern end of the park designed to replicate the secluded Adirondack forests of central New York State. 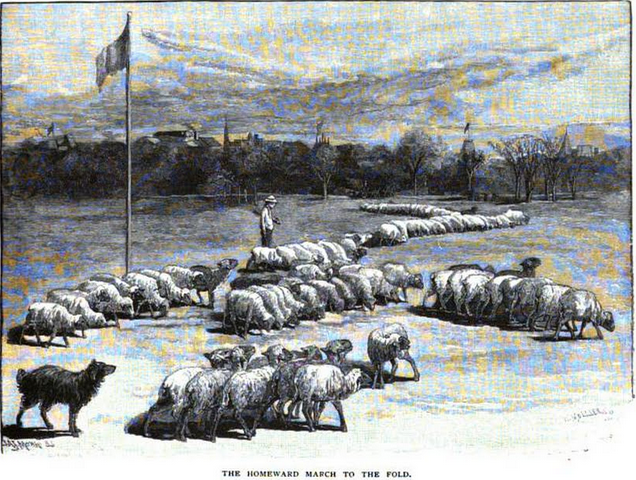 “Although much less was done to rearrange the northern end’s rugged topography than had been done elsewhere, park workers built a twelve-acre lake called the Harlem Meer on the swamp, carved out and planted the Ravine and Waterfall, and constructed another mile of drive, a mile and a half of walks, and several rustic bridges,” reports centralparkhistory.com. The result: “Within the woodlands, traffic disappears, buildings are hidden by trees and a gentle stream bubbles over sounds of the city, states the Central Park Conservatory website. It really does feel like a slice of the Adirondacks just yards from the subway. And hidden in the thick forest is one of the city’s oldest structures: a blockhouse from the War of 1812. 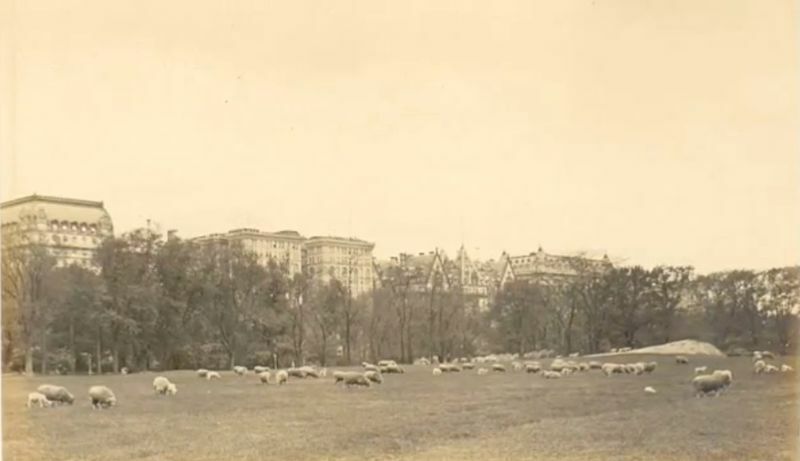 Before Central Park became a park, the 843 rocky, hilly acres in the middle of Manhattan were not empty of human life. About 1,600 residents clustered there in tiny settlements. Seneca Village was one, an African-American and Irish enclave of tiny houses and churches near Seventh Avenues in the 80s. 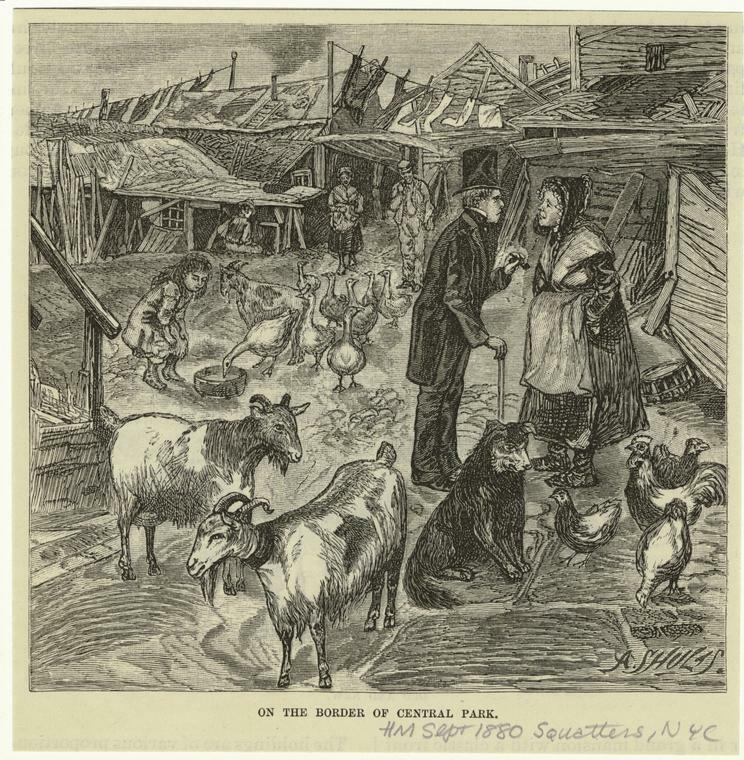 Pigtown, near the southeastern end, “was home to about 14 households, roughly three-quarters of them Irish,” wrote Roy Rosenzweig and Elizabeth Blackmar in The Park and Its People. Small groups of Irish as well as Germans dotted other parts. These residents were poor, but they worked in the service trades or ran businesses, kept animals, and some owned the land beneath their homes. 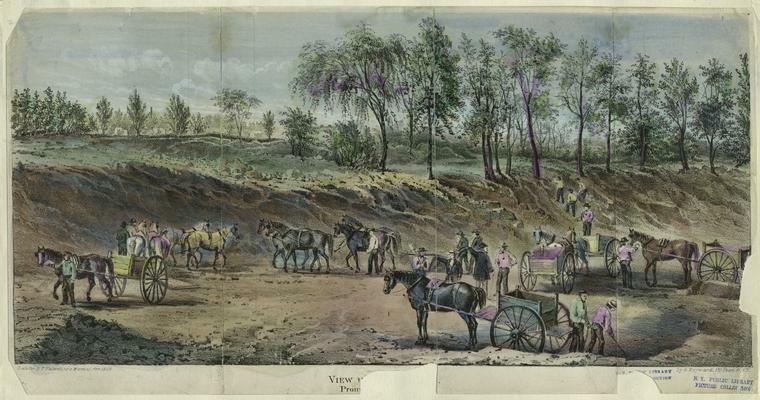 Still, when the idea of a city park was taking shape in the 1850s, they were described in newspaper editorials as squatters and thieves who plundered natural resources. Their days were numbered, of course. 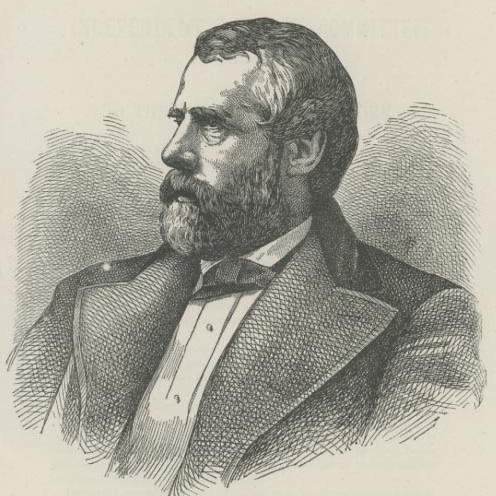 “First came the orders in the late spring of 1856 that they would henceforth have to pay rent to the city if they wanted to remain even temporarily in the houses and on the lots they long occupied,” stated Rosenzweig and Blackmar. Next, the new Central Park police hassled them about the businesses they ran, the firewood they chopped, even a dance hall at the northern end. 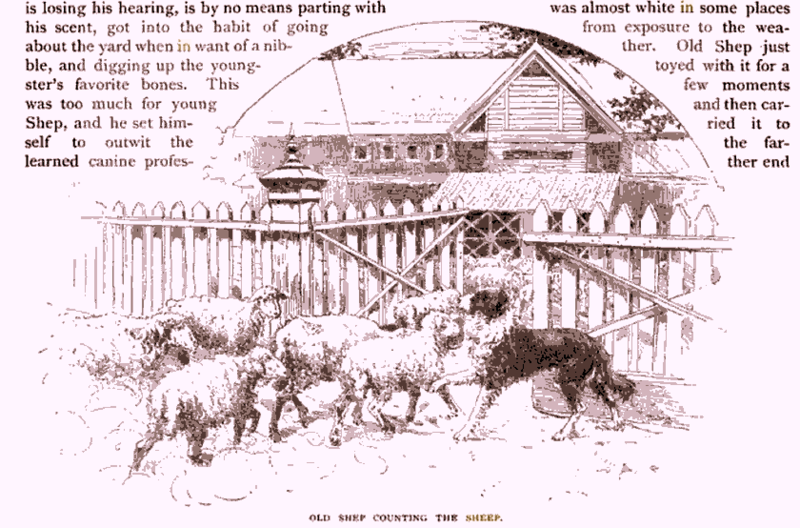 Piggery owners were given eviction orders in summer 1856. 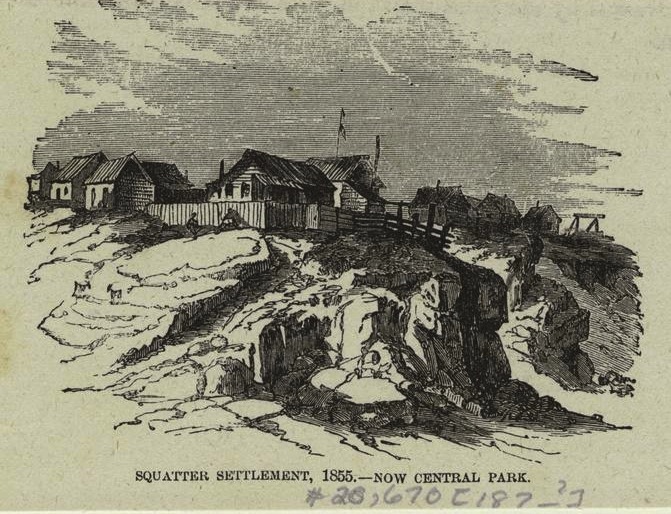 In October 1857, two years before Central Park opened, all residents were kicked out for good (though some simply went to shantytowns just outside the park). 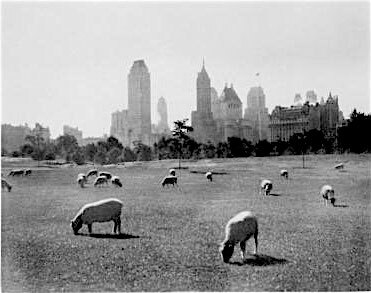 In the 1930s, Central Park became home to another group of squatters: the residents of a Depression-era Hooverville. 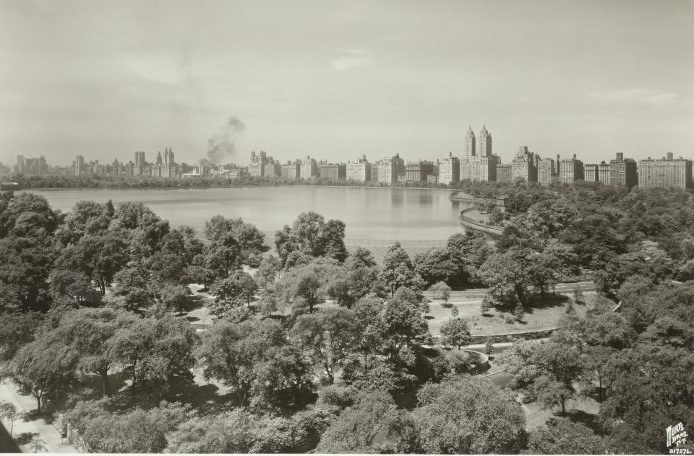 The Central Park Reservoir (renamed for Jacqueline Kennedy Onassis in 1994) has always inspired New Yorkers—who gaze at it, jog around it, and got their water from it between 1862 to 1993, when it was deemed obsolete. And on a grim note, many city residents were also inspired to jump the four-foot cast-iron fence around it and commit suicide. That original fence “was sufficient to prevent anyone from accidentally falling into the reservoir, but did not prevent self-destruction,” a March 10, 1926 New York Times piece explained it gently. As a result of all the suicides, city officials later that year put up a 10-foot chain link fence with barbed wire at the top. Sure it stopped people from hurling themselves into the water. But it was also ugly. 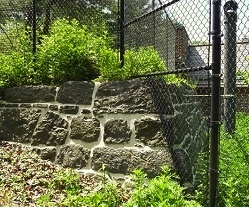 Calls were made for it to be taken down in the 1990s, but it wasn’t until 2003 that the Parks Department replaced it with a copy of the original 1862 fence—the one encircling the Reservoir today (above photo). 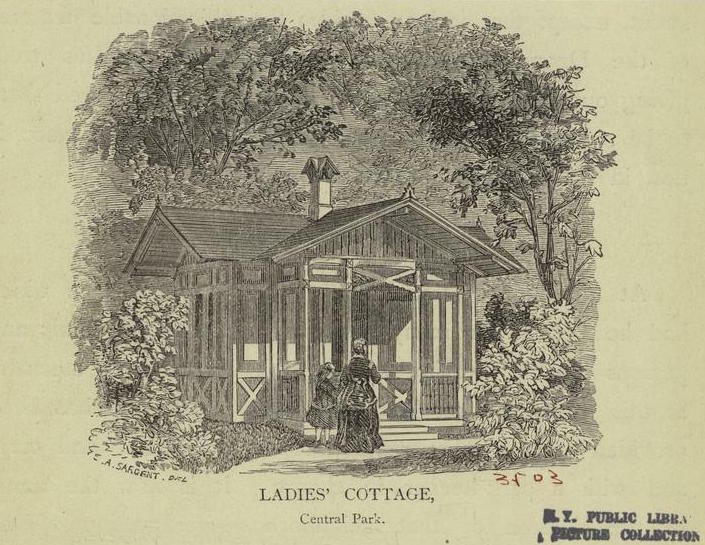 Who named the gates of Central Park? 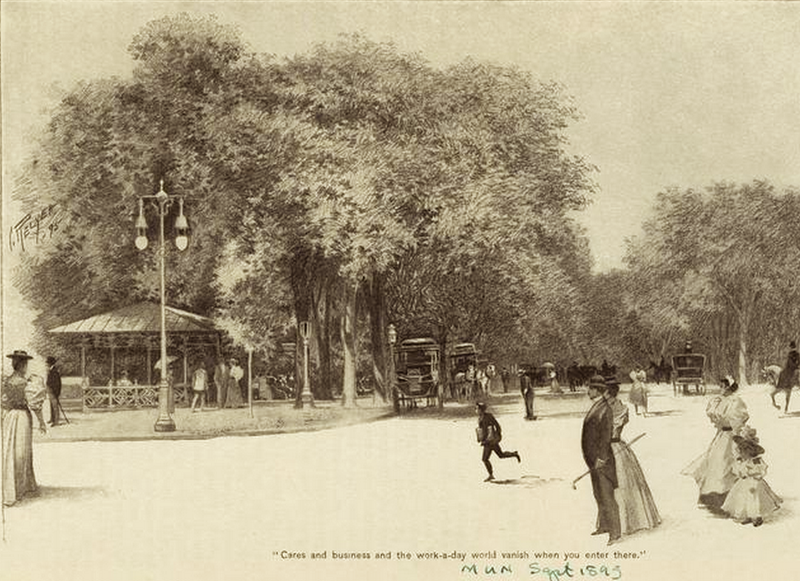 When Frederick Law Olmsted and Calvert Vaux were just about done building Central Park in the early 1860s, there was one more thing to consider: the entrances. While rich New Yorkers desired grand, ornate gates like in the urban parks in London and Paris, Olmsted and Vaux opted for low sandstone openings—symbolizing an accessible city refuge that would be open to all. Actually almost all did end up as official names, though most weren’t carved into the sandstone entrances until the 1990s. 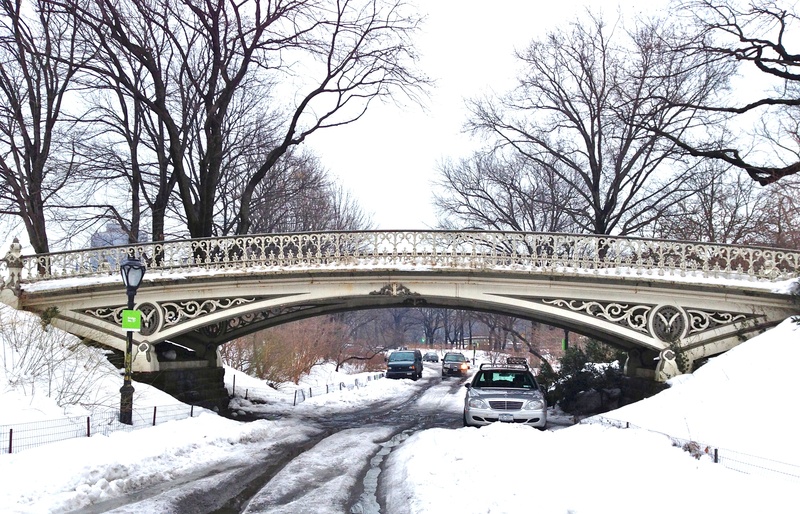 Women’s Gate is at 72nd Street and Central Park West; Scholars’ Gate at Fifth Avenue and 60th Street. A complete list is here.